The Jason Will Real Estate Team has begun touring the hottest selling condo developments in Gulf Shores and Orange Beach on a bi-weekly basis, to ensure that our Condo Specialists are up to date on the important aspects of those specific developments. Our beach ladies tour the active units for sale, check on the condition of the exterior and inspect the property amenities. They also provide their opinions of these gulf beach properties from both an agent and an prospective buyers perspective. Last week they chose to tour Phoenix West II, the 20th development to date for Brett Robinson and their latest luxury condominium in Orange Beach, AL. Phoenix West II is still currently under construction, yet the building is currently pre-selling units and Diana is working with a hot buyer interested in the penthouse, so they chose to brave the dangers of a live construction site to gain first hand knowledge of this amazing new project. 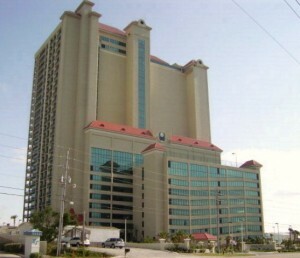 When I sat down to interview Diana about their visit, she made a few noteworthy points about Brett Robinson, in that their developments were some of the first towers to be erected on the beach in the early 80’s and their name recognition and brand awareness has become a staple of authority in the minds of consistent vacationers to the Alabama Gulf Coast. Brett Robinson also retains management of all of their developments and is one of the top property management companies on the beach. The penthouse unit was still under construction, yet they were able to step out onto the 3,000 square foot balcony, with panoramic views west of the coastal Alabama landscape. One thing Diana noticed, that she hoped that the developers would change, was that the balcony above overlooks the penthouse balcony below, limiting the privacy of the owners. Prospective buyers should also note that this development does not offer deeded parking spaces, yet there are ample spaces to allow parking for up to two vehicles per unit. Beyond that, she was impressed with the impeccable view, the spacious floor plan and the fact that each unit will feature a wet bar. Diana also commented on the uniqueness of the Lazy River, which includes both shade and sun features. There is also a two story fitness center and each units has its own climate controlled storage area. I think investors would be interested to learn that some pre-sale buyers have actually been able to assign their contracts to buyers at a higher contract price. It has been a while since we have heard of this practice but I think a lot of the property speculators out there will remember the days of real estate “flipping!” The Penthouse Unit 1203 is apparently on its second owner and is currently listed by a local broker for sale. For prospective buyers looking to finance a Phoenix West II unit, you will have do so via Canadian hedge fund, Oxbridge Capital Group. Oxford Capitol is offering to finance units for an additional 20% fee, of the current $525,000 offer price for all non-penthouse units, which will be required at closing. Last stop for the ladies was lunch at Zen, a pacific rim fusion restaurant in Orange Beach. The lunch menu features everything from sushi to burgers and after surveying the menu, I think I would be all over the wok seared fish sandwich. Yet, Diana claims that the onion rings with garlic aioli sauce are to do die for! Tour Phoenix West Orange Beach Alabama with the Jason Will Real Estate Team 251-866-6464.